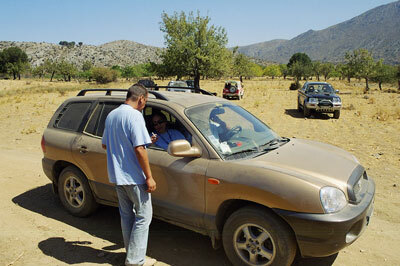 Porto Club Vacations: 4x4 JEEP SAFARI IN CRETE!!! 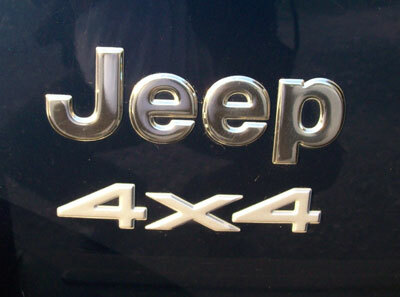 4x4 JEEP SAFARI IN CRETE!!! Crete is definitely one of the places that you should visit when you go for a Greek getaway. There are plenty of activities that you can do while staying here. Crete is truly rich in culture and history so you'll definitely enjoy its stunning architectures and monuments. 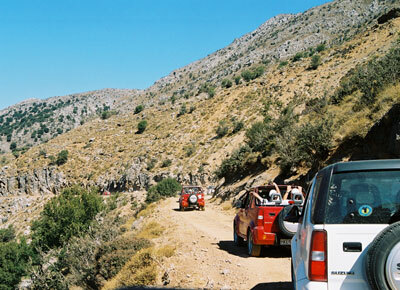 Another fun and exciting activity would be exploring the great Cretan mountains. You will find the true picture of Crete not only in its magnificent monuments and tradition, but in its nature as well. The Cretan mountains are famous for their herbs and aromatic plants. Variety in landscapes, fertile plateaus, deep fabulous gorges, monasteries, villages, castles and lonely traditional houses and hill tops. Taste the healthy Mediterranean delicacies, savour the local snaps Raki and the fine Cretan wine. Feel the magic of the clear skies, the smell of the aromatic plants, the full moon nights. Feel the warmth of Cretan company. TAKE THE CHANCE AND ENJOY ALL THOSE WONDERFUL THINGS!!! and presentation our weeks program. Dinner at local restaurant. First touch of the Cretan gastronomic reality. We will visit the village of Kroussonas. Cross the village climb up the mountain. and... that fine smell of aromatic plants. We will end to Nida plateau. We come to the point where Zeus the king of gods, grew up. Join the view. Go down the mountain to Anogia, Honos, Drossia, Lunch time, Lamb & Pork on spit, French fries fried in olive oil , fresh season salad , cheese of the area, cheese pies with honey , and Risogalo (Sweet pudding with rise and fresh milk), our MENU. Through the nature, visit of two forgotten monasteries, HALEPA and VOSSAKOS. We can’t describe the beauty and the feelings. You have to find it yourself.. Dinner at the hotel. SOUTH CENTRAL CRETE - OMALOS PLATEAU. This is a magnificent mountain 4 X 4 road to the peaceful plateau of Omalos. Pure, unspoiled, seas of wild flowers, beautiful landscape, clear light blue sky and fresh air. Only us nobody else. If any one who likes walking, or lying down on the ground, or singing or shouting, is FREE to do so. Welcome to the nature. Picnic at the mountain. We join together the fire lighting, and the cooking .We taste meat and vegetables on grill, fresh warm bread, we drink pure home wine. Dinner at the hotel. SOUTH EAST CRETE - PLATEAU OF KATHARO. Through Viannos we go to Riza. We have a panoramic view of Myrtos and Ierapetra valley. Beautiful gorges. You can see picturesque villages, set deep in valley farmhouses, decrepit villages, healing plants and herbs. Metaxochori and Hristos. We go on, to plateau of Katharo. Forest of pine. Picnic at the plateau. We continue to Kritsa. On the way we have a magnificent view to the Agios Nikolaos and to the gulf ofMirabello. Dinner at the hotel. Is surrounded by lush massifs. In 1500 Venetians constructed a system to provide water to the land which still exists. 10.000 windmills used to work to transfer the water to the land .Through an ancient off road, we drive up to the plateau of Limnakaros. Go up to the Limnakaros shelter - 1.350 m - Picnic - Pass the mountain we come to Katofigi through unforgettable breathtaking , wild dry stone walls and beautiful gorges. SOUTH WEST CRETE - COUNTRYSIDE. Direction south. Coming to the village of Agia Barbara, direction to Zaros. Monastery of Vrontissi. Centre of the Cretan revolutionaries in 1866. Continue to Kamares village.Famous of its cave. To visit the cave it is necessary to walk aprox. 4 hours. This cave during the Minoan civilization was a sacred place. Platanos, Kouroutes. Join the amazing variety of plant life and the multiform of the natural beauty. The natural face is changing all the time. We follow the way and come to the monastery of Arkadi. Back to the hotel. At night Cretan evening with folklore music and dance. A combination of countryside, seaside, on & off road. Long but nice trip. Direction west. short break, swimming, games with the sea. Drive north direction Imbros, climb up the mountain, to Asfendos, Kalikratis. Off road. Join the mountain. Off road ends at thevillage of Assi Gonia. Through a small canyon we come to the village of Argiroupolis. Short break. Dinner at the hotel. Adventure is over. Relax at your bed, or time left free for shopping. Transfer to the airport. Flight back home. Wine , refreshments , table water at the mountains. Office service 7 days per week from 08.30 to 21.00 hrs. Entrance fees to the archaeological ,historical sites. This program is available all year around. Based on minimum 4 persons up to 12 persons per group. George Portokalakis 1 Ιανουαρίου 2015 - 10:45 μ.μ. Get to know Crete a unique way! Her mountains, her villages, her cuisine and best of all her inhabitants. We offer you the means and the experience, our knowledge and connections and our love for the island we are living in!